One very useful feature of the DeployHQ platform is the ability to schedule deployments, whether that's an arbitrary deployment that you simply want to run at a later date and time, or a regular deployment that you wish to run once a day during quieter hours. 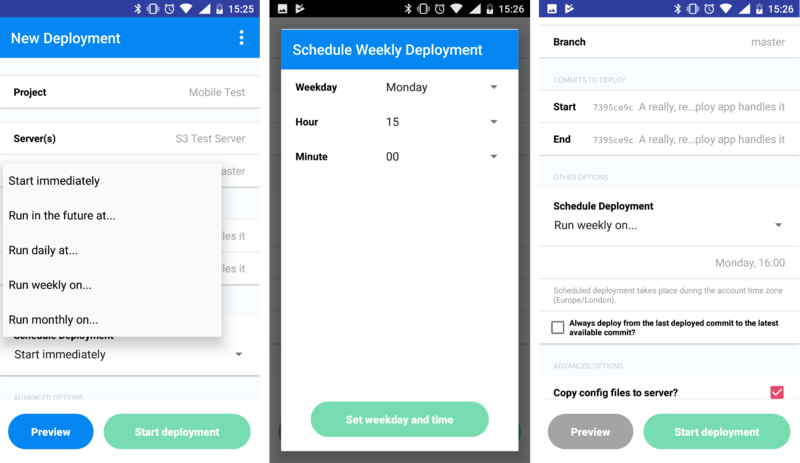 The scheduling functionality is all available within the mobile app, just pick your project and tap the Start a new deployment button, select your deployment configuration, then tap the scheduled deployment dropdown to choose a schedule. According the type of schedule selected, you'll be given additional options just below the dropdown, and if you want to always deploy using the latest deployed revision and the latest pushed to the configured branch for that deployment, you can enable that setting. Once you tap Start deployment your deployment will be scheduled for future execution. The DeployHQ mobile app is currently available for Android, with iOS coming very soon, you'll find out more about it in our initial announcement. We'll be publishing some more blog posts about the features you can take advantage of the new app, but let us know if you have any questions in the meantime.